Here are the details for the July 11th Photowalk. The Photowalk is hosted by Mack Camera (the company I work for), Photowalklist.com (my website) and also Think Tank Photo. We will be walking from Mack Camera in Springfield to Millburn, New Jersey. The walk is about 1 mile in each direction. What makes this Photowalk so special is we will have a bunch of mini classes along the way. The mini classes will be 5-10 minute classes on specific photographic subjects. More info is below. After reading all of the details please RSVP using the form at the bottom of this page to sign up for the Photowalk. Mack Camera will be buying pizza and drinks for everyone so a headcount would be helpful! Return to the Mack retail store after the photowalk for great giveaways including a really unique bag from Think Tank Photo, the Rotation 360. Neil van Niekerk is a world renowned wedding photographer will be teaching a mini class on photographing engagement photos on location. Want to teach a mini class at the photowalk? Let me know asap! If the lot behind the Mack building is full then make a RIGHT out of our driveway onto Morris Ave and then your first right at the big white church onto Church Mall. Parking could be found on the street. If by chance that is full too, go down the street and make a right on Academy. This is where Mack employees typically park so there should be a lot of parking spaces there. If that is also full then there may be spots in downtown Springfield on the street and behind stores. Hopefully everyone will be able to find parking safely. 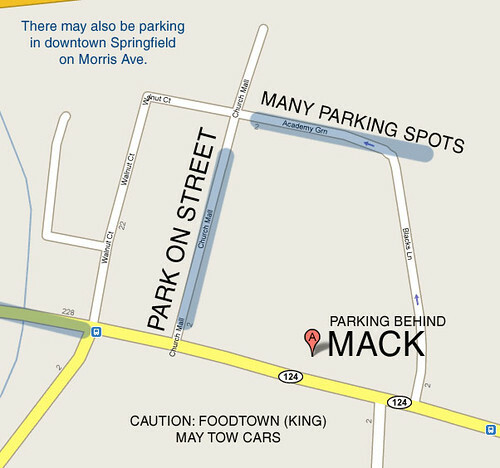 CAUTION: Foodtown (now Foodking) has big signs that say they will tow cars. I would LOVE to do this. I bought Neil's book and just love his teaching, and so exciting it's somewhere close by (I'm in Dover, Morris County). Unfortunately, my church is having it's last service before closing it's doors forever and I need to be there. I truly hope you will do something very similar again soon! You can use whatever camera you would like. There are no rules.